The Morgens West Foundation Galleries of Ancient Near Eastern Art will open to the public on Saturday, Nov. 10, after a nine-month renovation. A transformative gift from Sally and Jim Morgens, longtime friends of the museum, provided the opportunity for a new architectural design and curatorial vision, which have led to the integration of technology in the galleries as well as new opportunities for enhanced viewership and learning. 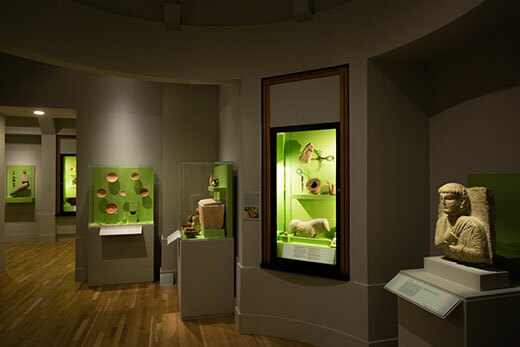 Melinda Hartwig, curator of ancient Egyptian, Nubian and Near Eastern art, and the Carlos Museum’s exhibition design team worked with Emory design staff and architects from the firm Lord Aeck Sargent to reconfigure the galleries. The reconfiguration creates an open and welcoming space that better supports the dynamic narratives of the ancient Near East as told by 300 works of art. The artwork on view, which includes cuneiform tablets, pottery, carved stone and metal weaponry and coins, illustrates the deep connections between artistic representation, innovation and the landscape of the ancient Near East. At the heart of the ancient Near East is the Fertile Crescent, so named in reference to its mineral-rich soil and shape of the land mass extending from the Nile Valley along the eastern Mediterranean and down to the Persian Gulf. With an abundant water supply and fair weather, early civilizations thrived, and the domestication of plants and animals led to permanent settlements. Social organization and favorable environmental conditions allowed residents to explore the use of natural materials and develop technologies such as smelted metal, stone carving, monumental building and wheel-made pottery (thus enabling the first mass production of objects). Cities, ruling classes and organized religion emerged. From the development of writing came administration, record keeping, literature and poetry. *Fee: $10 for Carlos Museum members; $15 for nonmembers. Space is limited, and registration is required by contacting Katie Ericson at kericso@emory.edu, or 404-727-2363. *For children ages 3-5 with an accompanying adult. This program is free, but registration is required by contacting Alyson Vuley at 404-727-0519 or avuley@emory.edu. *Fee: $8 for Carlos Museum members; $12 for nonmembers; children ages 5 and under are free. Registration is required by contacting Alyson Vuley at 404-727-0519 or avuley@emory.edu. *Space is limited, and a reservation is required by calling 404-727-6118. *Fee: $60 for Carlos Museum members; $75 for nonmembers (includes the cost of the books). Registration is required by calling 404-727-6118.